Playscape Recordings is proud to release I Ching, featuring veteran pianist/composer Peter Madsen. 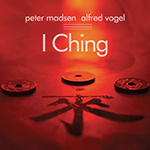 I Ching is veteran pianist/composer Peter Madsen's ninth release as a leader on the Playscape Recordings label. This duo release is Madsen's second CD project with Austrian drummer/percussionist Alfred Vogel - a member of Madsen's Collective of Improvising Artists (CIA) - following Madsen's Soul of the Underground CD in 2013. This is Vogel's first date on Playscape as a co-leader, though he has appeared with Madsen on three other Playscape releases. I Ching, a 3000 year old Chinese divination tool, described by Madsen as "full of practical wisdom that continues today to influence millions of people worldwide in the realms of philosophy, art, business, religion, psychoanalysis, literature", first piqued Madsen's interest 30 years prior to this recording. "I was fascinated and started asking the I Ching questions almost every day to get ideas about my life," writes Madsen in his liner notes. "I discovered that the I Ching didn't predict the future but instead helped you to think deeply about yourself and what you want and where you are going and when is a good time to do something!" "I decided to try something new to guide our free improvisations – the I Ching," writes Madsen. "A quick intro to the I Ching: first you ask a question of the I Ching. Then you throw three coins six times. Heads counts as three and tails as two. You add the numbers together and get a number between 6 and 9. Each number represents a solid line or broken line. You stack these up into a hexagram made of two symbols consisting of three lines each, each representing one of 8 symbols: thunder, wind/wood, fire/light, earth, lake/marsh, heaven, water, or mountain. So you end up with two symbols on top of each other giving 64 possible answers for you to contemplate. Before each piece I threw the coins and ended up with two symbols one for Alfred and one for myself that we used as the inspiration to focus our improvisations!" There are no reviews for this recording.